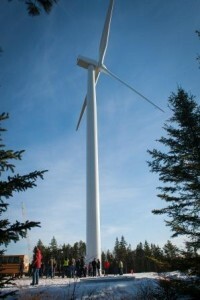 The South Canoe Wind Project, governed by Oxford Frozen Foods, with operations & maintenance by Acciona Energy, was proposed as an answer to the Province. The province set a renewable electricity target of 25% of generation from renewable sources by 2015 & 40% by 2020. 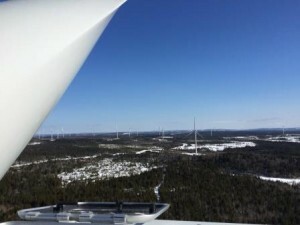 The South Canoe Wind Project was awarded a contract to provide renewable electricity which will enable the province to achieve their renewable electricity goal. The project includes 34 wind turbines, which will produce enough energy to serve approximately 32,000 homes, & is located near the settlements of New Ross & Vaughn. 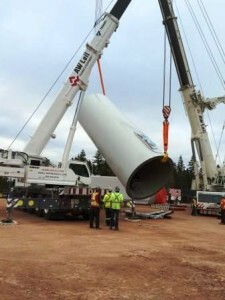 It has been interesting watching the mammoth wind turbine parts snake their way from Liverpool, NS, down the 103 to Hwy 12 and to their current location, since October 2014. It took 5 months & 340 deliveries to bring the necessary parts to their final home, and as of March 2015, all have been delivered. During this time, you could monitor the delivery trucks progress by GPS tracking on the South Canoe website, which allowed commuters to alter their routes, and the South Shore School Board and South Canoe to work together to ensure no conflicts between the school bus schedule and the delivery trucks. 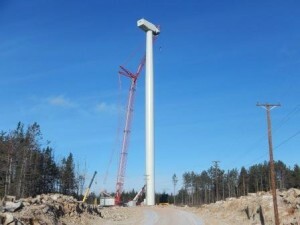 South Canoe, along with contractors Acciona & SureSpan, have completed the construction of all 34 wind turbines, 3 of which are producing electricity. It was the commitment of South Canoe to utilize as many local resources as possible on the project which have accounted for 400,000 man hours clocked to date, many local jobs created and continued support to the community. The goal of completion is end of May 2015, with an “Open House”/ community celebration for local residents, June 21st, 2015. Visit South Canoe Wind Farm for more details, or how to RSVP.